Friday night, I didn’t sleep. I tossed and turned, my restless legs bounced around like fish out of water, not caring how much iron I’d ingested the day before. I finally accepted that I wasn’t going to sleep and turned to reading, watching television shows on my phone, and praying (yes, some of my prayers were definitely for sleep!). I decided that since it was a fun day, I’d skip any makeup and just toss my hair on top of my head. Don’t pregnant women have a glow that excludes them from the necessity of primping? At 12:30, we headed to a nearby Starbucks to discuss plans with our birth photographer, the amazingly talented award winner Keren Fenton. We had fun talking about our ideals for photographing the birth, what we were or weren’t comfortable with (no crotch shots! ), and how to make sure she was able to get there in time. Since Keren is good friends with my sister and some mutual friends, we also had a great time just chatting about life and pregnancy. Keren is now due in just a couple weeks! The time flew by, and Eric and I suddenly realized that we would barely have time to heat up a couple slices of leftover pizza before we needed to go to movie theaters. We needed time to stop at the store for a birthday card for my brother and a chapstick for the birth bag (because who wants chapped lips when they’re delivering a baby?). While Eric got the pizza in the oven to reheat, I was struck with a sudden urgent thought and called my family. “Hi Dad, can I borrow mom’s small inflatable exercise ball? I want to have it at home in case I need one for labor.” I heard him talking with my mom. Once we’d scarfed our pizza down, Eric and I headed to Walmart which was right next to the movie theater. I was all business as I strategized dividing up the list. Eric was going to look for an Xbox gift card while I picked out a birthday card. Then he’d meet me in the cosmetics area where I would get my Burt’s Bees chapstick and we could check out. I made a beeline for greeting cards and immediately spotted the perfect one. We had decided to get my brother, who’s autistic, a card from his future nephew, certain he’d be more excited for that than yet another card from Eric and I. The one I grabbed had penguins on it and some message about being a “cool” uncle. Finding the chapstick was quick as well, so I decided to go all the way to the back of the store to grab potato chips for Sunday’s Seahawks game. I’d told Eric the day before that I needed some in the house because I thought I might get salty cravings during labor (we had learned the importance of eating during labor through our Bradley classes), so I grabbed a second bag just in case. The whole time I was walking through the store, people kept trying to stop me to ask when I was due, tell me I looked about to pop, or say how pregnant I was. They were all very nice but I was on a mission and found their attention distracting. Sometimes I didn’t even realize someone was speaking to me until after I’d walked away! Eric and I caught up with each other, bumping into my sister and her boyfriend (now fiance!) who were also doing last minute birthday shopping. Yes, I might have literally bumped into them, that tends to happen a lot when you have a belly the size of a watermelon! “We’re driving into the lot now. I want to drop the ball off at your car.” Eric stepped out and waved, spotting my parents’ car while mom and I were still talking. My dad pulled up behind us and pulled a fully inflated ball from the back of their car, my brother giggling excitedly in anticipation of our family movie time. Once my sister and her boyfriend caught up with us, Eric and my brother went in to save seats while the rest of us got in line for snacks. My dad said he was buying, and I knew that I wouldn’t make it through a three hour movie, plus the typical wait to be seated and have your food brought to your table that comes with a restaurant experience. I settled on a popcorn and a Coke for Eric and I to share. I’d pretty much cut caffeine out of my diet over a year ago, but was so tired from my sleepless night that I thought the small amount of caffeine might help me enjoy our afternoon and evening more. When we walked into the theater, we were shocked at the people packed in like sardines. Poor Eric couldn’t find 7 seats together, so was trying to save pairs of seats a few rows apart. Fortunately, he had several pillows that we’d brought for my sitting comfort. Who would try and steal a seat with someone’s bed pillow in it? The seat Eric was really guarding was the one for me. He knew I needed an aisle for my likely multiple trips to the restroom. Although he couldn’t get one on the same side of the theater door, he somehow got there just in time for one of the last aisle seats. We all made our way over right as the trailers got started. Although we’d already seen the movie, Eric and I were really enjoying it. The girls next to us were cracking up at everything, my brother Jason loudly pointed out a couple things in the movie (such as recognizing a character from the trilogy) and caused everyone in the theater to laugh in amusement, oh, and I was chowing down on popcorn and Coke. Then, at 4:30, an hour into the movie, I was hit with a Braxton Hicks contraction (or so I thought!) that not only took my breath away, but made me hold it for about 15 seconds. Eric, knowing I was in pain from the iron grip I had on his knee, rubbed my back to help distract me. Once, it subsided, I tried shifting to another position to get more comfortable, but less than five minutes later, I once again was in the throes of fist clenching, teeth gritting pain. Knowing how many times in the past these practice contractions had been painful just because I needed a good poop (Hey, it’s a birth story, expect talk of bodily functions! ), I decided to head to the bathroom. Doing an awkward duck walk across the front of the theater, so people in the front row knew I was at least trying not to obstruct their view, I tried to get there as quickly as I could before another contraction hit. I was sitting in the stall for a couple minutes before I realized that there was a man and a woman in the stall across from me! The strangeness of that situation helped distract from my own physical discomfort, and I became focused on being really quiet so they wouldn’t know I was there, as if I was somehow the one doing something out of the ordinary. Since the stall was a handicapped stall, I’m guessing it was a woman with her caretaker, but the sounds she was making while he urged her to hurry up made for a very awkward eavesdropping. 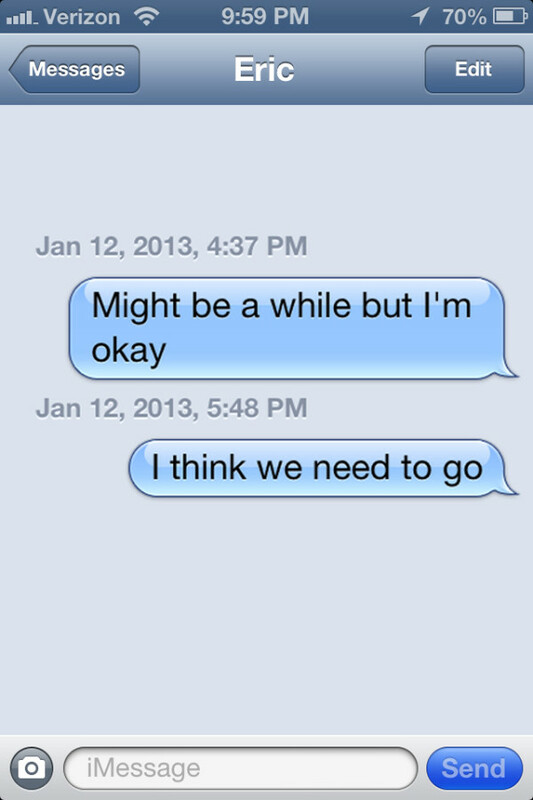 I sent Eric a text so that he wouldn’t worry about me disappearing for 15 minutes. Finally the couple left, and I decided that it was just too difficult to use the bathroom, and I should head back into the theater. When the next contraction hit, I began doing deep breathing, trying to get in a comfortable position without making it obvious to anyone around me that I was in pain. I didn’t want them to think I was going into labor or something! Still certain that I really just needed to empty my intestines, I headed back to the restroom, smiling at a mother and baby on the way, and thinking that I would soon be the mom who takes her baby out of the movie to calm their fussing. This time, the contractions on the toilet hurt so much that I started to cry out in pain. I began wondering if this might actually be the start of labor. I decided that even if it was, knowing it would be hours and hours, I would just breathe through the contractions and smile my way through the movie and family dinner, not telling anyone that I thought the baby might be on his way. “Well here, let me get the door for you!” He rushed to open the door to theater and I thought what nice customer service he had. I wonder if he was actually worried that I was going to deliver the baby then and there and that he, as the closest person, would have to catch it, like TV shows and movies always seem to portray. Perhaps he had some sort of sixth sense for these things. Deciding I needed to stand for a little while, I stayed in the sort of hallway leading from the doors to the seats, leaning against the slanted wall formed by the stairs on the other side. Thankfully, the wall had a low end that was just the right height for me to throw myself over so that I wouldn’t fall as the next contraction nearly knocked me off my feet! Once I was released from its fiery grip, I squatted on the floor, which was surprisingly comfortable, and pulled out my phone to text Eric. “I think we’d better leave.” I peeked around the end of the wall to see him gathering our belongings and whispering to my sister and father. He later told me that he didn’t tell my brother, certain he’d loudly inform the whole crowd that I might be having a baby in theater. Smiling, he led me to the parking lot, stopping once more for a contraction that should have pulled me out of my denial that I was truly in labor. In the five minute drive from the theater to our house, he excitedly (but softly) chanted, “Baby! Baby!” He so wanted this to be the start of of his coaching session he’d been training the past several months for. Once we got home, I climbed into the slowly filling tub while Eric began creating the perfect atmosphere. He lit candles and set them on the counter and windowsill, then brought in the ipad with a bluetooth speaker to play classical music. He knelt next to the tub, murmuring words of encouragement, when the next contraction hit me so fiercely that I began contorting trying to find a position to ease the pain. I actually reminded myself of Gollum, trying to wrestle his dinner out of the river. I was instantly hit with a fear I wasn’t expecting. I wasn’t normally afraid of pain, and I hadn’t felt any fear about labor or delivery before this moment, but the fear was so strong that it almost overpowered my pain. I was expecting hours of labor, and that it would grow exponentially worse over time, and I now knew that it would be physically impossible. My mind was strong, I’d made it through so many intensely painful experiences without shedding a single tear through a mind over matter mentality. But this was different. I knew with absolute certainty that if this pain was going to last 18+ hours and be ten times worse by the end, my body would give out before my mind did. I was going to die. 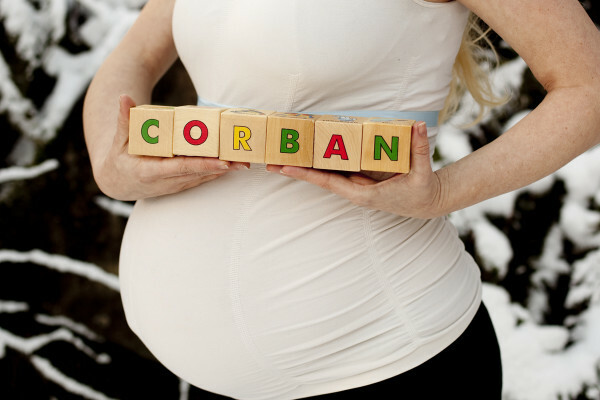 Stay tuned for the third and final chapter of Corban’s birth story. Hahahahaha. Just having gone through this 3 months ago I can totally relate to the fear when the pain hits. 🙂 I was in such agony and when they told me I was only 4cm I was ranting that there was no way I could handle twice the pain. I was begging for an epidural by that point, even though that was the one thing I didn’t want! Looking forward to the next installment. Sure makes me laugh! I’ve had 3 kids – I understand. OH! I’m on pins and needles now! =) Thank you for sharing your birth story it’s so inspiring! Great story, excited for Part 3/the Finale!